I'm writing a document in spanish language. Since I need to use spanish accents (for example "camión") the best encoding should be utf-8. They occur just where the spanish accents are. Okay, I think the errors are because the .tex file is in ANSI. 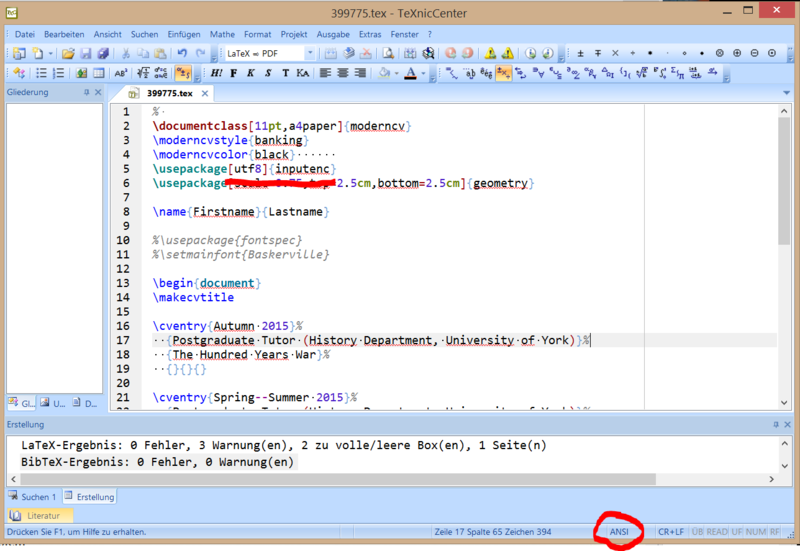 I proved it opening the TeX, changing it to UTF8 without BOM (using NotePad++) and zero problems when trying to compile it. So far, I have two possible solutions: the one I wrote above and just using ANSI (removing inputenc) and writing the accents using '\. Both ways work but they are tedious. Is there any better solution? UPDATED: Fast solution: just change the TeX Editor. I'm using now TeXmaker and all is ok. But anyway, maybe there is a solution to users who wants to still use TeXnicCenter so I leave it open if there is a better solution. 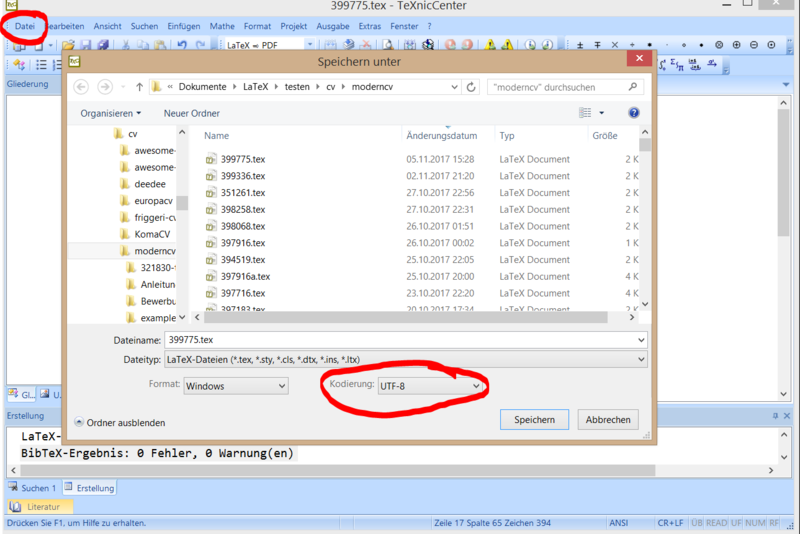 the tex file wants utf8 encoding (red line) but TeXnicCenter shows in the red circle that it uses ansi. Not the answer you're looking for? Browse other questions tagged input-encodings texniccenter or ask your own question. 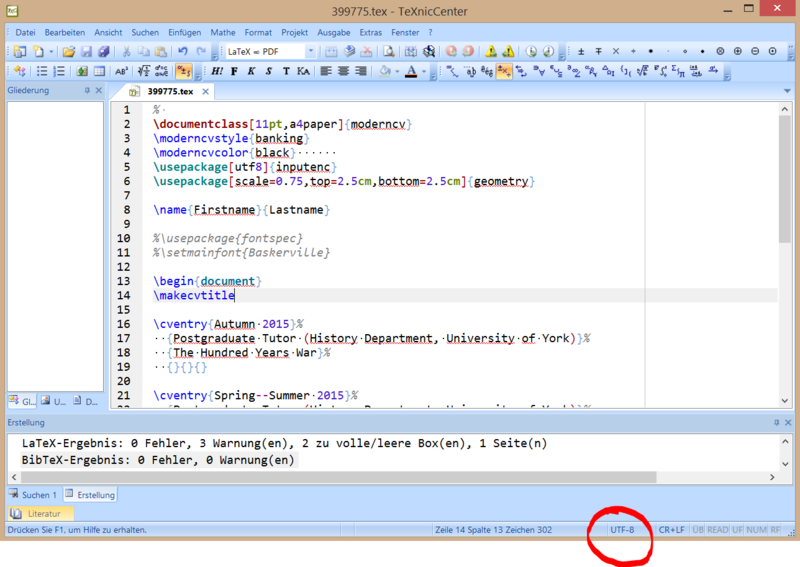 How to solve the `Package inputenc Error: Unicode char not set up for use with LaTeX` problem?